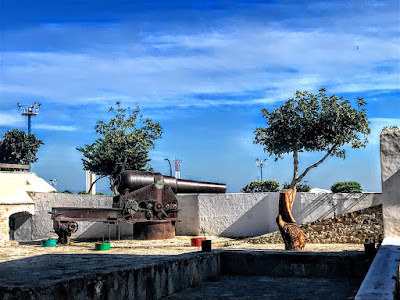 On my way to and from Tangiers yesterday, I travelled through the small port of Tarifa, on the southernmost coast of mainland Spain and continental Europe. At exactly 36 degrees latitude, Tarifa is further south than two African capital cities – Tunis and Algiers. Although Malta, Cyprus and the most southerly Greek islands of Crete and Gavdos are further south, and Gavdos is the southernmost point of Europe, Tarfia is the most southerly point on the European continental landmass. Tarifa features in Paulo Coehlo’s novel The Alchemist (1986), in which a shepherd boy visits Tarifa to meet an interpreter of dreams and ask him to interpret his recurrent dream. His life takes a dramatic turn when he meets an old king of Salem named Melchizedek in the city market place. It was a 200 km bus journey from Seville, through the windfarms and the pueblos blancos of Andalucía, and passing Jerez and Cádiz on our way. The windfarms north of Tarifa mean Spain has the world’s second-highest installed capacity of windpower, and the country aims to meet 20 per cent of its energy needs from renewable resources by 2020. Jerez is the sherry producing capital of Spain, and these fortified wines have been produced by generations of Anglo-Andalucian families in their bodegas, giving us names such as Sandeman and Harvey. The formal name of Jerez is Jerez de la Frontera, an ending for many of the villages and towns among the pueblos blanocs, close to the former frontiers with the Muslim world. As our bus took us through the winding, white-washed streets of Tarfia, we could see we were on the way to North Africa. This is the last stop in Spain before Morocco, the last stop between Europe and Africa. Tarfia is best known as one of the world’s most popular venues for wind sports. The town is on the Costa de la Luz (‘coast of light’) and across the Strait of Gibraltar facing Morocco. Tarifa may have been an early Phoenician settlement. Later, this was the site of the Roman settlement of Julia Transducta, also known as Julia Joza, or simply Transducta. However, that settlement is now thought to have been at Algeciras, while Tarifa may have been the site of the settlement of Mellaria. The village of Bolonia near Tarifa was also populated in Roman times, when in was known as Baelo Claudia. The Emperor Claudius gave the place the status of a municipality, but it was effectively destroyed by an earthquake in the second century and abandoned in the sixth century. Some Roman ruins survive, including a theatre, a necropolis and several erect columns, as well as a statue of Trajan. Tarifa is sometimes said to explain the origin of the word ‘tariff,’ as this was the first port in history to charge merchants for the use of its docks, but other sources point to the Arabic word ta'rïf, as the origin. Instead the name Tarifa is derived from the Berber commander, Tarif ibn Malik, who attacked the place in 710. The well-preserved Castle of Guzmán el Bueno still stands near the port, near the port, was built in 930 by the Caliph Abd-ar-Rahman III. After the Islamic conquest of southern Spain, the city was fortified starting from the tenth century. Later Tarifa was held by the Muslim rulers of Algeciras (1031), by the rulers of Seville (1057), and by the Almoravids. After the fall of the Almoravids, Tarifa was ruled again for a short period from Algeciras (1231), before becoming part of the Kingdom of Granada. In 1292 it was conquered by Sancho IV of Castile. Legend says that when Guzmán el Bueno or Guzmán the Good was defending Tarfia and the fortress against the Moors, his son was taken hostage and he was told he would die if Guzmán did not surrender. Laconically, Guzmán threw down his dagger to attackers, saying he would prefer to lose his son than to lose his honour. He gives his name to the castle at the port, which incorporates the earlier fortress built by the Caliph Abd-ar-Rahman III and the Church of Saint Mary, built on the site of a former mosque. The town once had three gates, but only the Puerta de Jerez, dating from the 13th century, has survived. Tarifa resisted further sieges by North African Islamic troops in 1294 and by Moroccan troops in 1340, eventually leading to the Battle of Río Salado. The Church of Saint Matthew, built in Tarifa in the early 16th century in Gothic style, also stands on the site of a former mosque. The façade was redesigned by Torcuato Cayón de la Vega in 1774. At the end of the 18th century, Tarifa was the childhood home briefly of Doña Josefa Eugenia Maria Francisca Comerford MacCrohon de Sales (1794-1865) until she was adopted by her uncle, Enrique Comerford, Conde de Bryas, and moved with him to Dublin. During the Peninsular War in the early 19th century, when Spain and Britain were allies against Napoleon, Tarifa was besieged by French troops on 20 December 1810, and again on 18 December 1811. 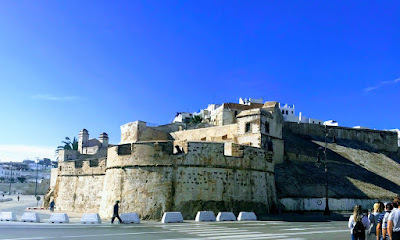 In both cases, the town was defended by British troops from Gibraltar. Today, Tarifa’s unique wind conditions have made the beaches at Playa de Los Lances, Valdevaqueros and Punta Paloma the most popular in Europe with windsurfers and kitesurfers. The funnel created by the Strait of Gibraltar creates a Venturi effect when either the Viento de Levante or easterly wind from Africa or the Poniente or westerly wind from the Atlantic is blowing. These two winds prevail in Tarifa for over 300 days in most years. This means Tarifa experiences exceptionally strong and consistent winds throughout the year, making it the windsurfing and kitesurfing capital of Europe. But instead we were taking the ferry from Tarifa to Tangiers. 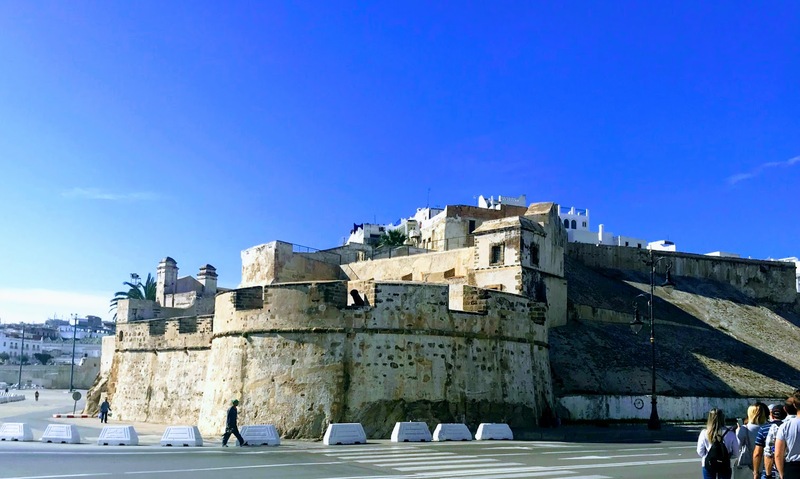 I crossed the Strait of Gibraltar by fast ferry yesterday [25 October 2018] and sailed to Tangier, on a day trip from Seville, to explore the Medina and to visit the caves where god Hercules is said to have slept. It was an opportunity to discover a unique blend of European and African cultures and taste the delicious food. Tangier once had three Irish Governors in the 17th century when it was an English colony for less than quarter of a century between 1661 and 1684. King Charles II acquired the city as part of the dowry when he married the Portuguese princess Catherine of Braganza. The marriage treaty was an extensive renewal of the alliance between England and Portugal. It was opposed by Spain, then at war with Portugal, but received clandestine support from France. England garrisoned and fortified the city against hostile but disunited Moroccan forces. The first Irishman to act as governor of Tangier was Colonel Sir John FitzGerald, who was lieutenant governor from 7 June 1664 to April 1665, He was the son of Gerald FitzGerald, of Ballygleaghan, Co Limerick. He was descended from a branch of the FitzGerald family of Glin Castle, Co Limerick, who were Knights of Glin. This John Fitzgerald was a colonel in the Irish Regiment of Tangier in 1663, although he was a Roman Catholic. Later, he held the office of Governor of Yarmouth in 1672, and he died in 1678 at Nonsuch Park, Surrey. He had no children, but perhaps if he had descendants the title of Knight of Glin would not have died out in recent years. The second Irish Governor of Tangier was William O’Brien, 2nd Earl of Inchiquin, who was Governor from 1675 to 1680. He was appointed Governor in succession to the Earl of Middleton in 1675, and that year a garrison school was founded, led by the Rev. Dr George Mercer. 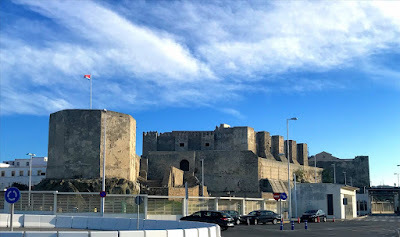 He had succeeded his father as Earl of Inchiquin in 1674, and was Captain General of the Forces at Tangier from 1674 to 1680 and Colonel of the 2nd Tangier Regiment of Foot from 1675 to 1680. He commanded the Tangier Garrison at the time of the Great Siege of Tangier in 1680. Later, he was the first Governor of Jamaica and Vice-Admiral of the Caribbean Seas from 1690 to 1692. He died in Jamaica in 1692 and his Irish estate and titles were inherited by his son, William O’Brien. When Lord Inchiquin resigned as Governor of Tangier in 1680, he was replaced by a third Irish governor, Thomas Butler (1634-1680), Earl of Ossory. He was born at Kilkenny Castle, the eldest son of James Butler, 1st Duke of Ormond, and his wife Lady Elizabeth Preston. However, Lord Osssory died on 30 July 1680 before he could take up his post in Tangiers. His son, James Butler, succeeded as the 2nd Duke of Ormond eight years later in 1688. Meanwhile, the cost of maintaining the English garrison against Moroccan attack greatly increased after Morocco was united under the Alaouites. Parliament refused to provide funds for its upkeep, partly due to fears of ‘Popery’ and fears arising from the imminent of a Catholic succession of James II. In 1684, Parliament forced Charles II to give up his possession on the north African coast. The English forces blew up their defences and evacuated the city, which later became part of Morocco. The British military presence in this part of North Africa returned briefly in the 20th century. The Tangier International Zone was a 373 sq km international zone under the joint administration of Britain France, and Spain, and later Portugal, Italy, Belgium, the Netherlands, Sweden and the US from 1924 until its reintegration into independent Morocco in 1956.